Early in our relationship, camping became a yearly tradition for Andrew and me. One of our favorite destinations is New York’s Catskills region, in particular the town of Saugerties. We love the close proximity to New York City—about a two hour drive—which allows us to get away for a long weekend without much fuss. Here I’ve put together a little guide of some of our favorite things to do in the lower Hudson Valley. Giant Ledge: This intermediate 3.5-mile out-and-back hike starts off with a fairly steep trek up rocky terrain in a beautiful wood. I was surprised how strenuous it was because I’m usually good with ascending, but your payoff comes quick. After only 1.5 miles, you’ll find yourself on level ground with access to a series of open ledges with dazzling views. 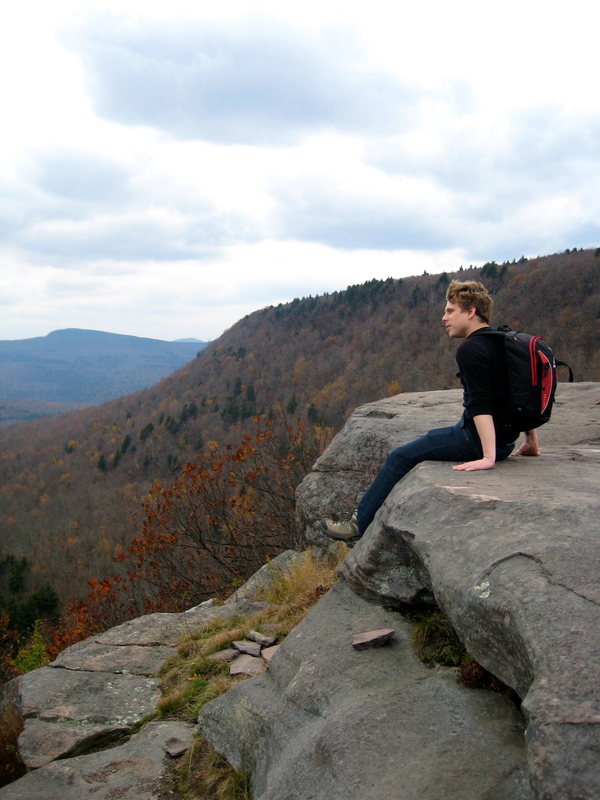 The view is amazing and you feel like you’re on the edge of the world due to the steep drop-off from the ledges. We visited in the fall and the autumn colors were breathtaking. One nice thing about the hike is that the journey up is just as lovely as the view at the top. Overlook Mountain: This 5-mile out-and-back hike has a few very unique features that make it well worth adding to you list. One is an abandoned hotel about 2 miles into the hike. The hotel burned down not once but twice, but a good portion of the stone walls remain. 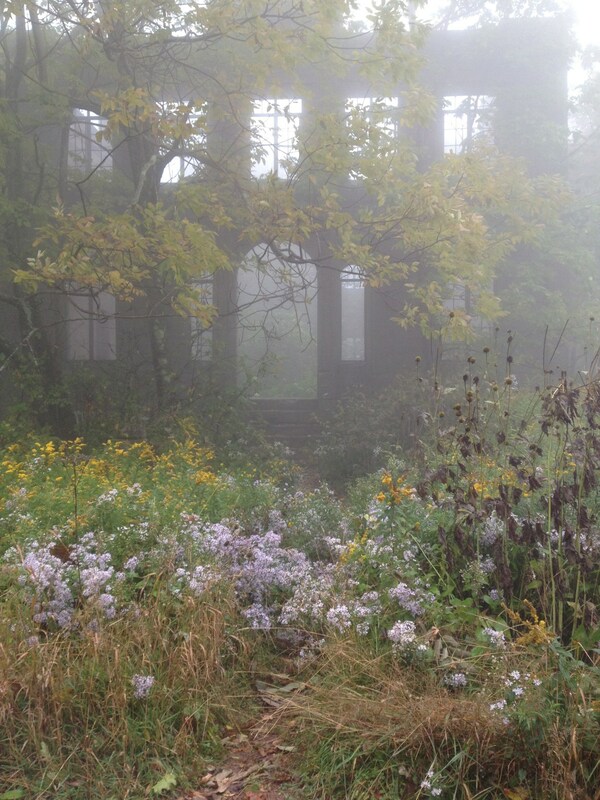 We happened to hike it on a misty day and the ruins were totally eerie in the filtered light. 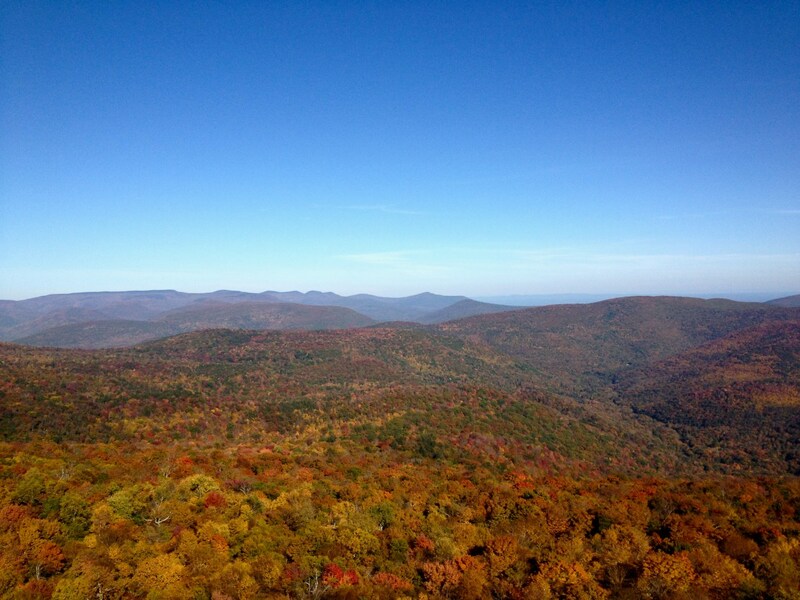 At the top of the mountain you’ll find a fire tower that is open to the public, so the brave can get an even better panoramic view from the top. My one critique of this hike is that the trail up isn’t that scenic or enjoyable. Most of the trek up is on a wide gravel track without much wildlife to enjoy. The hotel and fire tower are so cool though, that it makes the uninspiring first leg worth it. 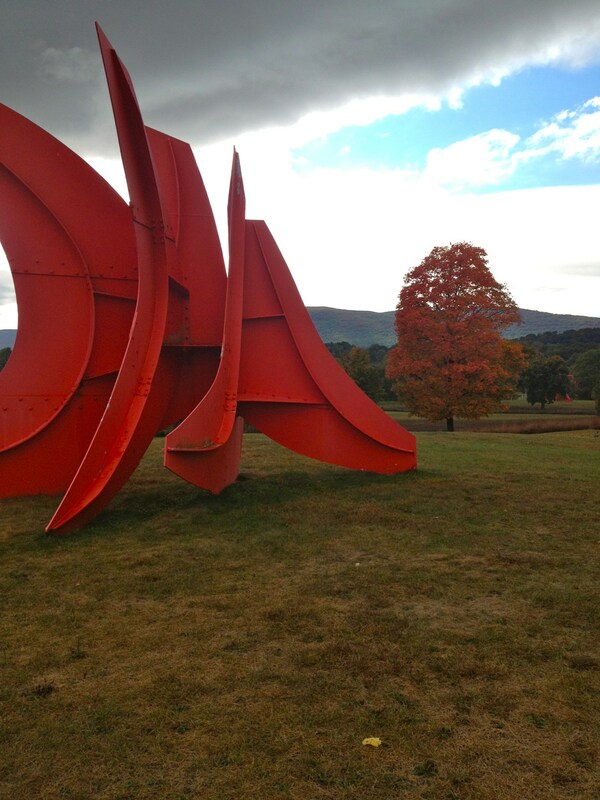 Storm King Art Center is not to be missed. 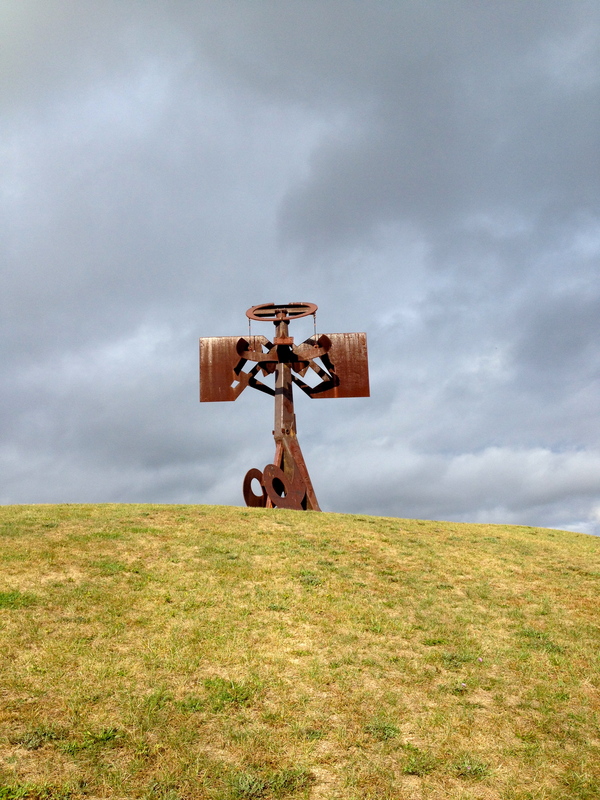 This massive outdoor sculpture park is sited on 500 rolling acres, including open meadows and shaded woods, and you’ll find over 100 modern works of sculpture dotted throughout. It is absolutely a whole new experience to view art like this. You can see some pieces from very far away and really appreciate the forms they create against the landscape, and how they change in different lights. Then, as you get closer, you experience their true scale and start to pick up on the details of the work. We also saw some wildlife around the park: a mother deer with her youngster and a woodchuck (fun fact: also called a groundhog or even a whistle pig, depending on where you live). Highly recommend this as a stop on your itinerary. 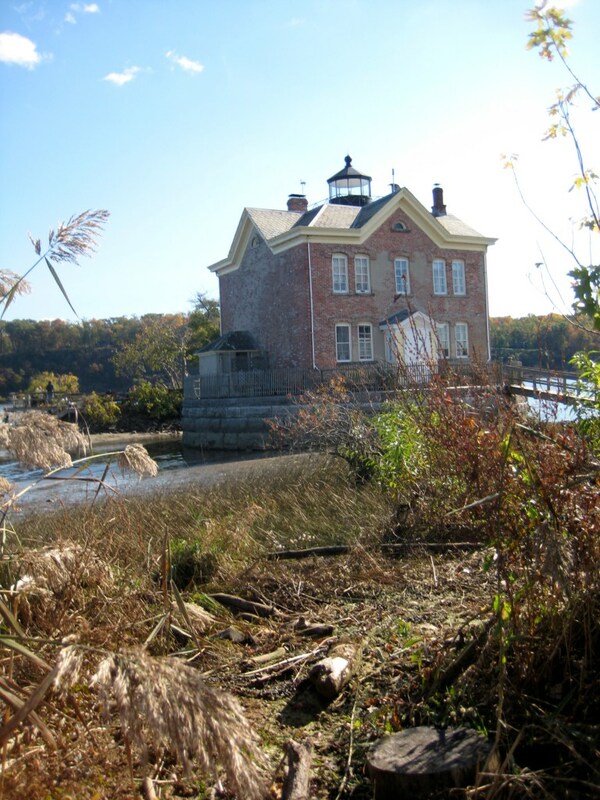 Another cool attraction in the area is the Saugerties Lighthouse. Now operating as a bed and breakfast, it’s only accessible by boat or a walking trail—but, be warned! The trail can only be accessed at low tide. When the tide rises, access from the mainland is cut off and the lighthouse finds itself on an island. Check the tide timetable on their website to plan your visit and bring a picnic lunch to enjoy on the sunny dock surrounded by the Hudson River. The area is ripe with orchards and farms, perfect for a quick apple-picking stop or a bit of farmer’s market shopping. Andrew and I always make it a point to cook out on the fire when we’re camping, so we haven’t eaten out a lot during our stay in the area. That said, we do have a favorite lunch spot: the Dutch Ale House in downtown Saugerties. We stop here every year because I’ve become addicted to one item on their menu: The Pilgrim Sandwich. This decadent sandwich, inspired by Thanksgiving, can really only be eaten once a year, but it is so, so worth it. House roasted turkey, stuffing and provolone cheese are pressed onto marble rye bread and accompanied by two to-die-for condiments: cranberry relish and gravy. It is insane. Insanity in sandwich form. But I love it so much. Basically it is Thanksgiving dinner in one bite. Ugh, now I totally want one.